As a core mechanic of Blueprints 3.0, components are found throughout the map. Not everything requires components. Many early game items can be crafted without components or blueprints. Here is a list of all major components along with their rarity, where to find them, and what crafting recipes use them (quantity required is in parenthesis next to each item). Scrap is used in research tables to acquire blueprints by researching an item, though the learned item will be destroyed in the process. It is also used to craft workbenches and research tables. It can be used in work benches to gamble for a blueprint from the respective tier. A prerequisite to any secure base, or gate, gears are one of the core components. Used mainly for melee weapons and salvaged tools, blades are plentiful in barrels. Looking for fire power? You'll need pipes - and a lot of them. It’ll take stacks of this component to complete your Rust armory. Speaking of firepower, you won't have much till you have the springs to back it up. 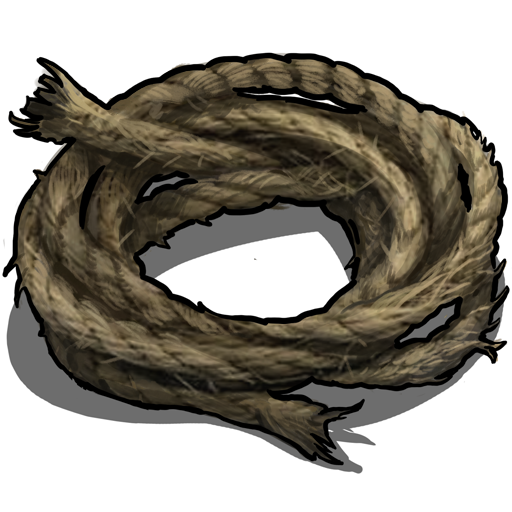 Required by every high tier weapon in the game, springs are bound to be one of the most sought after components. A necessity for a variety of things from armor to ladders, rope will always find a good use. Don’t expect to be doing any expeditions to the snow biome without using several of these, sewing kits are a requirement for all high-tier clothing and armor - oh, and beds. One of the lesser used components, road signs are good for two things at the moment. A key piece of several firearms, rifle bodies are found rarely in weapon crates. Like the rifle body, the SMG body is rarely found in weapon crates and used for submachinegun construction. You guessed it, the semi auto body is just like the SMG and Rifle body, only this is used to make P250's and semi auto rifles. Perfect for crafting water catchers, water barrels, planters, and FROG BOOTS! Tarps are also a great source of cloth when recycled. One of the most prized components - a key to raiding and some attachments - tech trash is rarely found in weapon crates. A key ingredient for the flamethrower, and also used in water purification (but seriously, who does that anyway? ), propane tanks are likely to be found more often than needed. Primarily useful for crafting heavy armor, they also yield a nice metal return when recycled. An unreliable electric fuse. Will allow electrical passthrough for a period of time. The recycler takes items or components and returns a percentage of the materials back (depending on condition of the item). Recyclers cannot be crafted at the moment, you can only find them in dungeons and monuments around the map. 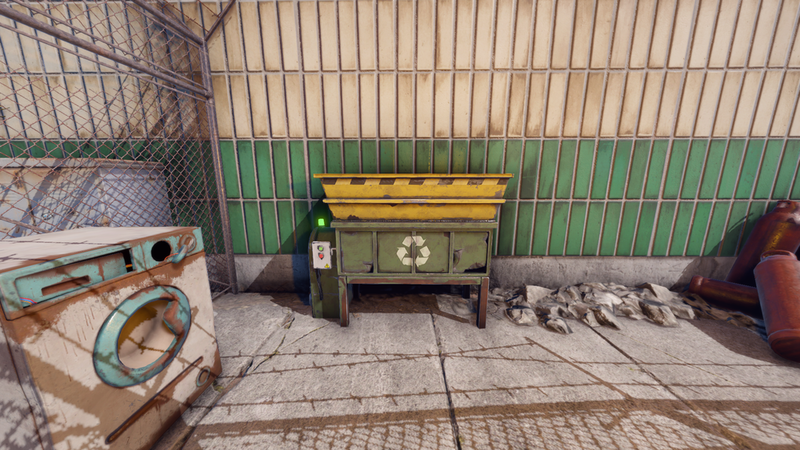 The recycler can be found on the second floor after going up the stairs on the small building. The recycler is found on the second floor after going up two flights of stairs in the long building. 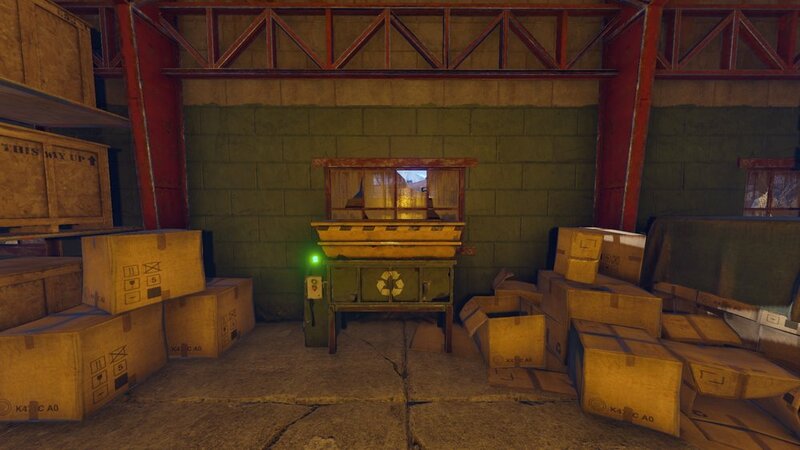 The recycler is found inside of the garage door on the right in the small building next to the conveyor. A recycler can be found in each of the possible harbors. It is located directly behind the first building on the left in the first harbor, and between the cranes in the other. 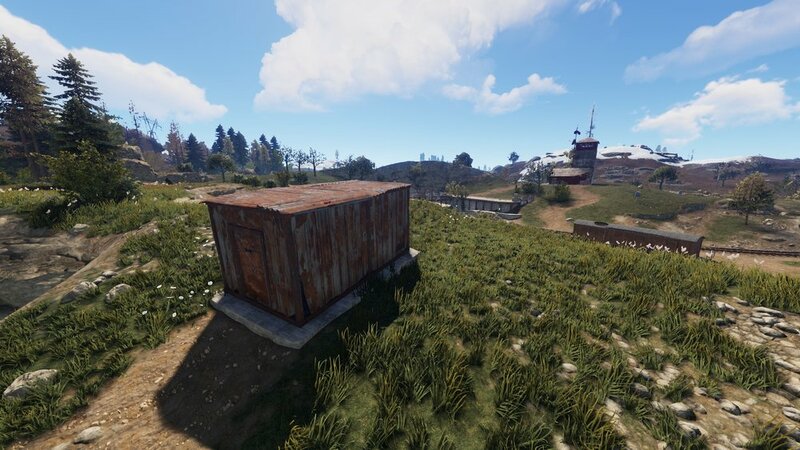 You can find the recycler by entering from the launch pad side, it's under the awning at the second building on the left. The recycler can be found in the fenced in area behind the building. The garage houses the recycler here. The recycler is found by climbing up to the raised shipping container next to the crane. 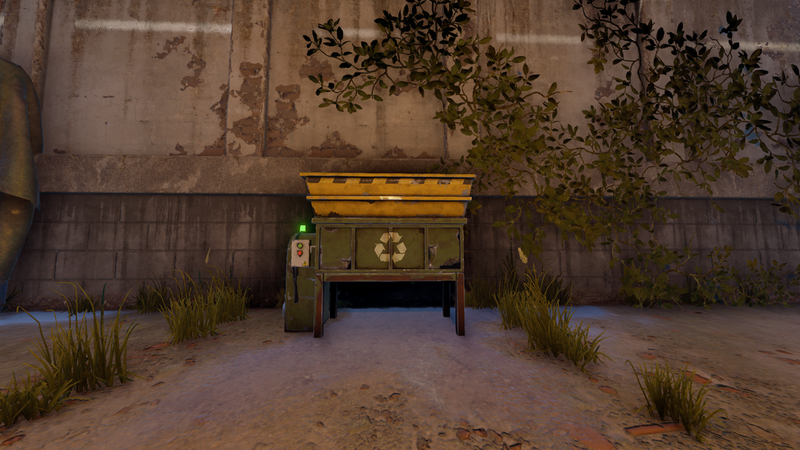 The recycler is found in a metal shack on the outskirts of the tunnel entrance. When entering from the side with the rusty watch tower the recycler is found in a colapsed building with "repairs" sign to the right of the road.